The T cell response to Shigella, the causative agent of bacillary dysentery, remains poorly understood. Using a murine model of infection, we report that Shigella flexneri primes predominately IL-17A– and IL-22–producing Th17 cells. Shigella-specific Th1 cells are only significantly induced on secondary infection, whereas specific Th2 and CD8+ T cells are undetectable. Apart from Th17 cells that are primed in a MHC class II- and IL-6–dependent, but IL12/23p40-independent manner, we identified γδ T cells as an additional but minor source of IL-17A. Priming of IL-17A+ γδ T cells is dependent on IL12/23p40, but independent of MHC-class II and IL-6. Th17 cells have emerged as important players in inflammatory, autoimmune, and infectious diseases. Among the yet unresolved questions is their role in long-term immunity to pathogens. In this study, we show that the elicited S. flexneri-specific Th17 pool gives rise to an enhanced recall response up to 12 mo after priming, suggesting the presence of a long-term memory state. The clearance of primary infection is impaired in the absence of T cells, but independently of IL-17A. However, after reinfection, IL-17A produced by S. flexneri-specific Th17 cells becomes important to ultimately restrict bacterial growth. These findings bring new insights into the adaptive immune response to Shigella infection and highlight the importance of pathogen-specific Th17 cell immunity for secondary immune protection. Shigella, a Gram-negative enteroinvasive bacterium, is the causal agent of shigellosis or bacillary dysentery, a major public health burden in developing countries. By invading the colonic mucosa, Shigella induces an acute inflammatory response, leading to massive tissue destruction, as reflected by the emission of bloody, mucopurulent stools. On natural infection, Shigella elicits an Ab-mediated serotype-specific protective immunity (1, 2). Priming of Shigella-specific T cell response and whether and how T cells contribute to protection remains ill defined. PBMCs isolated from volunteers challenged with a S. dysenteriae 1 vaccine candidate have been shown to produce IFN-γ, but not IL-4 and IL-5, after Ag-specific stimulation (3). Also, increased proportions of T cells expressing activation and memory markers and expansion of defined TCR Vβ families have been reported in patients with natural infection (4, 5). In the absence of a murine model of shigellosis, we used a mouse model of pulmonary infection to further investigate the Shigella-specific T cell immunity. This model is the only available animal model in rodents to study both innate and adaptive immune responses to Shigella infection, and therefore, has been largely used so far (6–11). Induction of the inflammatory process requires fully invasive Shigella, carrying the virulence plasmid encoding the virulence effectors mandatory for the invasive/proinflammatory phenotype. The two main steps leading to the induction of the inflammatory response in the intestinal environment, namely, the invasion of intestinal epithelial cells and apoptosis of resident macrophages in the dome region of the Peyer’s patches (2), take place in the pulmonary model of infection. Indeed, invasion of lung epithelial cells (10) as well as apoptosis of alveolar macrophages (9) occur on i.n. infection with Shigella. Because early interactions dictate not only the development of innate but also adaptive immunity, this model is relevant to study the impact of acute inflammation on the development of some adaptive responses, in particular the T cell response. Moreover, although obvious major differences exist between lung and gut environments, a couple of reviews have recently emphasized the similarities existing between those two compartments, in particular in regard to their ability to maintain homeostasis and to respond to invading pathogens (12, 13), including the importance of Th17 cells in both mucosal environments (14). Th17 cells are a recently identified Th lineage that are defined by the production of IL-17A and IL-17F, two members of the IL-17 family and other cytokines such as IL-22. Th17 cells have been shown to be pivotal in the pathogenesis of experimentally induced autoimmune and inflammatory bowel diseases (15). Th17-type cytokines are also produced during infections, thereby contributing to pathogen clearance (14, 16–18). However, several studies suggest that in the acute phase of infection these cytokines are predominately produced by non-T cells, innate-like γδ T cells, or nonspecific αβ T cells (18–21). The priming of pathogen-specific Th17 has been demonstrated (22–25), however, long-term maintenance and the function of Th17 cells in secondary immune responses to pathogens remain poorly understood. We demonstrate in this study that S. flexneri induces a predominant Th17 response, whereas Th1 cells that are only weakly primed and Th2 cells that are undetectable like Shigella-specific CD8+ T cells. The clearance of primary infection is independent of IL-17A. However, IL-17A produced by Shigella-specific Th17 cells ultimately restrict bacterial growth on reinfection, demonstrating that Th17 cells play an important role in mediating protective immunity to Shigella. M90T, an invasive isolate of S. flexneri serotype 5, and BS176 is its noninvasive, plasmid-cured counterpart, were used in this study (26). Bacteria were grown in Luria broth at 37°C with aeration. For mice infections, the bacteria were resuspended in a 0.9% NaCl solution. C57BL/6 wild-type (wt) mice were purchased from Janvier (St. Genest, France). CD3° (deficient in T cells), μMT° (deficient in B cells), Ab° (MHC class II deficient), β2m° (MHC class I deficient), and Ab°β2m° mice were obtained from CDTA (Orléans, France). IL-17RA° (deficient for the main receptor of IL-17A) mice were obtained from Amgen (Seattle, WA). IL-6° mice were purchased from The Jackson Laboratory (Bar Harbor, ME). Transgenic Rorc(γt)-GfpTG mice have been described recently (27). All mice were on the C57BL/6 background and housed at the Pasteur Institute (Paris, France) animal facility. All animal experiments described in this study received prior approval from the local ethics committee. FITC-, PE-, PerCP/Cy5.5-, PE/Cy7-, APC-, and APC/Cy7-conjugated Abs were obtained from BD Pharmingen (San Diego, CA) or eBioscience (San Diego, CA). Anti-CD4, -CD8, and -CD90 microbeads and magnetic separation columns were purchased from Miltenyi Biotec (Auburn, CA). Cells were cultured in RPMI 1640 supplemented with 10% heat-inactivated FCS, 25 mM HEPES, 2 mM glutamine, 1 mM sodium pyruvate, 50 nM 2-ME, 100 μg/ml streptomycin, 100 μg/ml gentamycin, and 100 U/ml penicillin (all from Invitrogen, San Diego, CA). Mice were inoculated intranasally (i.n.) with 3 × 107 bacteria in a volume of 20 μl. When indicated, mice were injected i.p with 80 μg/100 μl PBS of anti–IL-17A mAb (R&D Systems, Minneapolis, MN) or rat IgG (Chemicon International, Temecula, CA) directly postinfection (p.i.) (day 0) and at day 2 p.i. The weight of the animals was determined daily. At different time points p.i., mice were sacrificed, and the lungs and spleens were removed. Lungs were homogenated in 1 ml 0.9% NaCl solution, and serial dilutions were plated on trypticase soy broth agar containing 0.01% Congo Red to enumerate bacterial counts (CFU). Lungs and spleens were harvested from exsanguinated mice. Lungs were cut into small pieces, and digested for 30 min at 37°C in RMPI 1640 medium containing 500 U/ml collagenase type 4 (Worthington Biochemical, Lakewood, NJ) and 650 Kunitz units/ml DNase 1 (Sigma-Aldrich, St. Louis, MO). Lung cell suspensions and spleens were strained through a 100-μm cell strainer and subjected to red cell lysis (Red Cell Lysing Buffer; Sigma-Aldrich). Splenocytes isolated from naive mice were depleted of CD90+ cells (Pan-T cell marker) using the MACS system (AutoMACS Sperator, Miltenyi Biotec). The 2 × 106 cells/ml were then cultured in supplemented RPMI 1640 medium alone or in the presence of bacterial sonicates derived from S. flexneri M90T or Listeria monocytogenes 10403s (at a concentration corresponding to 20 bacteria per cell). Live bacteria versus heat inactivated bacteria versus bacterial homogenates were initially tested and no difference among the three types of Ag preparation was observed (data not shown). However, a high nonspecific stimulation was observed when specific Shigella and Listeria control Ags were added to APCs in the presence of naive T cells (negative control). This nonspecific background was largely reduced when Ags were removed from APCs culture supernatants before the addition of naive T cells. Therefore, because complete removal of Ags by centrifugation was only possible by using bacterial sonicates (that remain in the supernatant, whereas live or inactivated bacteria are in the pellet with APCs), APCs were preincubated for 8 h with the bacterial sonicates, then extensively washed, and subsequently cocultured with either naive T cells or effector T cells recovered from Shigella-infected mice as described later. The 2.5 × 105 unpurified effector cells (derived from lungs or spleens of infected or control mice) were cultured with 2.5 × 105 APCs (unloaded or loaded with sonicates from S. flexneri or L. monocytogenes) in 200 μl supplemented RPMI 1640 medium. Alternatively, when effector cells had been purified using the MACS system, 5 × 104 cells (for CD4+, CD8+) or 1 × 105 cells (for CD90+) were cultured in the presence of 2.5 × 105 APCs. Assays were performed in duplicates in 96-well flat-bottom plates. For FACS analysis cells were cultured for 36 h (the last 8 h in the presence of brefeldin A). For determination of cytokine release, supernatants were collected after 3 d of culture. RNA was prepared from lung specimens using the RNeasy Mini kit (Quiagen, Valencia, CA). RNA samples were treated with RNase-free DNase (Promega, Madison, WI) and reverse-transcribed using the SuperScript II reverse transcription (Invitrogen) and the oligo(dT)15 primers (Promega) as recommended by the suppliers. cDNA was amplified with the SYBRGreen PCR Master Mix (Applied Biosystems, Foster City, CA) and gene-specific primers (0.4 μM each) in the ABI PRISM 7900HT sequence detection system (Applied Biosystems) in duplicates. Gene-specific primers were purchased from Proligo (Sigma-Aldrich): Gapdh, 5′-CAACTTTGTCAAGCTCATTTCC-3′ and 3′-TCCAGGGTTTCTTACTCCTTG-5′; Il6, 5′-AATTTCCTCTGGTCTTCTGGAG-3′ and 3′-AAGGACTCTGGCTTTGTCTTTC-5′; Tgfb1, 5′-CCCTGGTGGTATACTGAGACAC-3′ and 3′-CCCAAGGAAAGGTAGGTGATAG-5′; Il12b (Il12/23p40), 5′-ACGGCAGCAGAATAAATATGAG-3′ and 3′-TGAGTTCTTCAAAGGCTTCATC-5′; Il23a, 5′-CCTGCTTGACTCTGACATCTTC-3′ and 3′-TGAGTCCTAGTAGGGAGGTGTG-5′. Relative quantification of gene expression was performed using the relative expression software tool (REST). Results were normalized using the Gapdh housekeeping gene. Cytokine levels were analyzed in cell culture or homogenate supernatants. ELISA for IL-1β, IL-4, IL-5, IL-6, IL-12p70, IL-13, IL-17A, IL-22, IL-23, CXCL1, CXCL9, IFN-γ, TNF-α, TGF-β were performed according to manufacturer’s recommendations (all Duoset [R&D Systems] except for IL-22 [Antignix America, Huntington Station, NY] and IL-23 [eBioscience]). For surface Ab staining, cells were incubated at 4°C for 30 min with Abs, and subsequently washed twice in HEPES-BSA buffer. For intracellular staining, the BD Cytoperm/Cytofix kit (BD Bioscience) was used, according to the manufacturer’s recommendations. Samples were analyzed using a FACSCalibur, BD LSR I or FACSCanto flow cytometer (BD Biosciences). Data analysis was performed using FlowJo software (TreeStar, Ashland, OR). Anti-LPS IgG Ab titers were determined by ELISA as previously described (28). Briefly, plates were coated with S. flexneri M90T LPS (5 μg/ml in PBS), serial dilutions of the experimental sera were plated, and anti-LPS IgG detected by an anti-mouse IgG-alkaline phosphatase-labeled conjugate (Sigma-Aldrich) at a dilution of 1/5000. Ab titers were defined as the highest dilution of serum samples giving twice the absorbance obtained with sera of naive mice. Lung tissue were homogenized in 50 mM potassium phosphate buffer (pH 6.0) containing 5% hexadecyltrimethylammonium bromide. Homogenates were freeze-thawed twice and centrifuged. Supernatants were diluted in potassium buffer (1:10, 1:40, and 1:160). A commercially available myeloperoxidase (MPO) (Sigma-Aldrich) in 2-fold serial dilutions (1–0.003 U/100 μl) was used as a standard. The 100 μl samples and standard were added to 100 μl assay buffer (potassium phosphate buffer, 0.32 mg/ml o-dianisidine [Sigma-Aldrich], and 0.001% hydrogen peroxide), and MPO activity was assayed spectrophotometrically at a wavelength of 450 nm after 3 min. Single experiments were performed using 3–10 mice per group. If not stated otherwise, data are represented as cumulative data of all experiments and expressed as mean ± SEM or geographical mean ± SEM. Statistical significance was analyzed using the Mann-Whitney U test, Kruskal-Wallis ANOVA on ranks, followed by Dunn's tests for multiple comparisons, or repeated-measures ANOVA (Friedman), followed by Dunn's tests as required. A χ2-log rank analysis was used for survival curves. Correlation was analyzed using the Spearman’s rank correlation test. Significant statistical differences were indicated by asterisks: *p < 0.05; **p < 0.01; ***p < 0.001. Analysis was performed using GraphPad Prism v 5.0 software. To investigate the role of lymphocytes in the murine pulmonary model of Shigella infection (Supplemental Fig. 1), we infected CD3° (deficient for T cells), μMT° (deficient for B cells), and age-matched wt control mice with 3 × 107 S. flexneri M90T. In CD3° and μMT° mice mortality rates were slightly higher (Fig. 1A) and the body weight recovery was significantly delayed (Fig. 1B) when compared with wt mice. Although the numbers of bacteria (CFU) recovered from the lungs at day 3 p.i. were similar in wt, CD3°, and μMT° mice, the bacterial counts were significantly increased in CD3°, but not in μMT° mice, compared with wt mice at day 6 p.i. (Fig. 1C). These results indicate a critical role of T cells, and less importantly of B cells, in the immune defense during primary infection with S. flexneri. T cell deficiency impairs host immune defense against S. flexneri. A, Mortality (n = 32–78 per group), (B) weight loss (n = 14–42 per group), and (C) CFU counts in the lungs at day 3 (n = 16–29 per group) and day 6 (n = 9–14 per group) after primary infection of wt, CD3° and μMT° mice with S. flexneri M90T (3 × 107 CFU i.n.). D, Experimental protocol to test adaptive immunity against S. flexneri M90T. CD3°, μMT°, and wt mice were infected i.n. with S. flexneri (3 × 107 CFU) at week 0 and 3. Control mice received 0.9% NaCl (H2O) i.n. At week 11, control mice and previously infected mice were challenged with S. flexneri (3 × 107 CFU). E, Weight loss and (F) CFU counts in the lungs at day 3 p.i were analyzed (n = 14–40 mice per group). B–F, Weight loss is expressed as mean ± SEM and CFU counts are expressed as geometric mean ± SEM. G, Anti-LPS IgG titers measured in the serum of wt and CD3° mice 7 wk after the second infection with S. flexneri and naive controls. Each dot represents one mouse. To address the role of T and B cells in protection against reinfection, CD3°, μMT°, and wt mice were infected twice with S. flexneri at week 0 and week 3. Control mice received 0.9% NaCl i.n. After additional 8 wk (week 11), previously infected mice and control mice were challenged with S. flexneri (Fig. 1D). In wt animals, weight loss was reduced by 34–47% (Fig. 1E) and CFU counts were 1.3–2 logs lower (Fig. 1F) in reinfected mice compared with control mice at day 3 p.i. On the contrary, reinfected CD3° animals exhibited only marginal reductions in body weight loss (10%) and CFU counts (0.2 logs) (Fig. 1E, 1F). 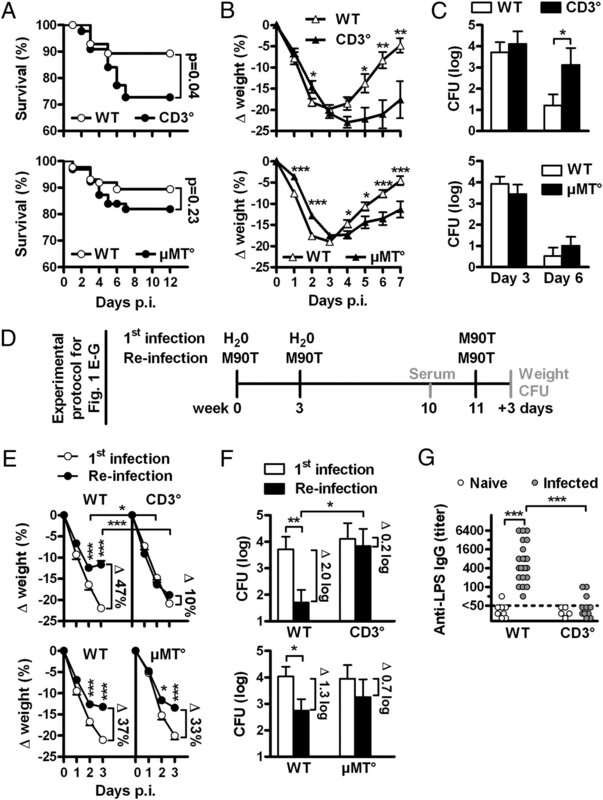 B cell-deficient μMT° mice developed an intermediate phenotype of protective immunity with only a slight defect compared with wt mice (Fig. 1E, 1F). Importantly, CD3° mice had significantly reduced titers of Shigella-specific anti-LPS IgGs (Fig. 1G). The results suggest that T cells mediate immunity to S. flexneri by B cell-dependent and -independent mechanisms. To assess the priming of specific T cells during Shigella infection, we performed ex vivo restimulation experiments using total lung cells cultured in the presence of Ag-loaded APCs and measured the production of specific cytokines. Ag-loaded APCs were generated by culturing T cell-depleted splenocytes (derived from naive mice) in the presence of Shigella total cell extracts (sonicates). APCs cultured in the presence of Listeria total cell extracts or in medium alone were used as controls. In lung cells isolated from noninfected or primarily infected mice, no significant production of IFN-γ was observed (Fig. 2A). On the contrary, lung cells isolated 6 d after a secondary infection exhibited a significant production of IFN-γ only when cocultured with APCs displaying Shigella sonicates (Fig. 2A). APCs displaying Listeria sonicates or unloaded APCs did not induce significant levels of IFN-γ production, indicating that the measured response was specifically directed toward Shigella-derived Ags (Fig. 2A). IL-17A could not be detected in pulmonary cells isolated from noninfected mice or primarily infected mice at day 3 p.i. (Fig. 2B). However, IL-17A was significantly produced by lung cells isolated from primarily infected mice at day 6 and 10 p.i. only when cocultured with APCs loaded with Shigella sonicates (Fig. 2B). After secondary infection, IL-17A production by lung cells was even further increased at day 6 p.i. and was still been significantly produced by lung cells isolated 8 wk and 7 mo p.i. Like IL-17A, IL-22 was significantly produced after primary infection (6 d p.i. ), further enhanced after secondary infection, and still significantly produced up to 7 mo p.i. (Fig. 2C). Culture supernatants were always negative for Th2-type cytokines, such as IL-4, IL-5, and IL-13 (data not shown). After Shigella-specific restimulation of splenocytes, production of low amounts of IL-17A, but not IFN-γ, could only be detected in cells derived from twice-infected animals indicating that the immune response against S. flexneri was largely restricted to the local organ of infection (Supplemental Fig. 2). Taken together, these results indicate that in the mouse pulmonary model of S. flexneri infection Ag-induced IL-17A and IL-22 production largely predominates over the production of IFN-γ, suggesting a preferential priming of Th17 over Th1 and CD8+ T cells. Shigella-specific cytokine production by lung cells isolated from naive and infected mice. Total lung cells were isolated from noninfected control mice and mice infected once or twice (week 0 and 3) with S. flexneri (3 × 107 CFU) at indicated time points p.i. Cells were cocultured with APCs previously cultured with medium alone or in the presence of bacterial sonicates derived from S. flexneri or L. monocytogenes. (A) IFN-γ, (B) IL-17A, and (C) IL-22 were measured in the supernatants after 72 h of coculture. Each dot represents the mean of duplicate cultures of cells derived from one mouse. Line represents the geometric mean of each group. To determine the source of IFN-γ, IL-17A, and IL-22 on Shigella-specific stimulation, we performed ex vivo restimulation assays with lung cells depleted of CD4+ and/or CD8+ cells (Fig. 3A) or purified CD4+ and/or CD8+ cells (Fig. 3B). These experiments revealed that the production of IFN-γ, IL-17A, and IL-22 was largely dependent on the presence of CD4+ cells (Fig. 3A, 3B). The Shigella-specific production of IFN-γ, IL-17A, and IL-22 was almost completely abrogated if APCs were deficient for MHC class II. On the contrary, cytokine production remained unaltered when APCs were deficient for MHC class I (Fig. 3C). These results indicate that IFN-γ, IL-17A, and IL-22 are mainly produced by CD4+ lymphocytes activated on MHC class II-dependent presentation of Shigella Ags. CD4+ T cells are the major source of IFN-γ, IL-17A, and IL-22 after Shigella-specific stimulation. A–C, Lung cells were isolated from wt mice 6 d after secondary infection with S. flexneri . A, Total lung cells, cells depleted of CD4+ and/or CD8+ cells, or (B) purified CD4+ and/or CD8+ cells were cocultured with APCs previously cultured with medium alone or in the presence of bacterial sonicates derived from S. flexneri or L. monocytogenes. C, Purified CD90+ T cells were cocultured with APCs obtained from naive wt, β2m° (MHC class I deficient), Ab° (MHC class II deficient), or β2m°Ab° mice and previously cultured with medium alone or in the presence of bacterial sonicates derived from S. flexneri or L. monocytogenes. A–C, IFN-γ, IL-17A, and IL-22 were measured in supernatants collected after 72 h of culture. Means ± range of duplicate cultures of pooled cells derived from seven mice are shown. One representative experiment of two is shown. D and E, Lung cells isolated from noninfected, or once- or twice-infected mice were cocultured for 36 h with APCs primed with Shigella sonicates. For the last 8 h, brefeldin A was added to the culture. D, FACS analysis of IFN-γ and IL-17A expression in CD3+CD4+ and CD3+CD8+ cells. Representative dot plots are shown. Numbers indicate means ± SD of n = 9–14 mice per group. E, Total numbers of IFN-γ+, IL-17A+, and IFN-γ+IL-17A+ CD3+CD4+ cells per lung. Each dot represents one mouse. Line represents the geometric mean of each group. In accordance with these findings, we found an increased percentage of activated CD44highCD62LlowCD4+T cells in lungs p.i. with S. flexneri, whereas the expression of CD44 and CD62L on CD8+ T cells remained almost unchanged (Supplemental Fig. 3). In addition, intracellular FACS analysis further confirmed that lung-derived CD4+, but not CD8+ T cells, were capable of producing IFN-γ and IL-17A after culture with APCs loaded with Shigella sonicates (Fig. 3D, 3E). CD4+ T cells isolated from lungs expressed no or only low levels of IFN-γ when isolated from noninfected or once-infected mice. After secondary infection, IFN-γ+CD4+ T cells (Th1) were detectable in the lungs of all animals (Fig. 3D, 3E). In contrast, IL-17A+CD4+ T (Th17) cells were found in all mice after primary infection. Secondary infection also induced a further increase in the number of Th17 cells resulting in a 6:1 ratio of Th17 to Th1 cells (Fig. 3D, 3E). Moreover, we also observed a significant induction of IFN-γ+IL-17A+ double-positive CD4+ T cells in mice infected twice (Fig. 3D, 3E), which coincided with a strong positive correlation between the priming of Th1 and Th17 cells in individual mice (Supplemental Fig. 4). Although CD4+ T cells were shown to be the main producers of IL-17A, we found that CD3+CD4−CD8− T cells derived from infected, but not from noninfected mice, were also capable of producing IL-17A (Fig. 4A). NKp46+, NK1.1+, and CD11b+ cells were shown to be negative for IL-17A production (Supplemental Fig. 5). CD3+CD4−CD8−IL-17A+ cells exceeded the number of Th17 after one infection and accounted for ∼40% of total IL-17A+ cells after secondary infection (Fig. 4B). Further analysis revealed that the majority of IL-17A+CD3+CD4−CD8− T cells were γδ T cells (Fig. 4C). However, the mean fluorescence intensity of the IL-17A signal was approximately five times lower in CD3+CD4−CD8− T cells than in Th17 cells, indicating that Th17 cells produce more IL-17A per cell (Fig. 4A, 4B). Furthermore, in the absence of MHC class II expression on APCs, Shigella-induced IL-17A expression in CD3+CD4−CD8− cells was only slightly reduced, whereas it was largely diminished in CD4+ cells. This further indicates that CD4+ T cells are the major source of IL-17A, because in the absence of MHC class II expression on APCs, the release of IL-17A in the supernatants was reduced to <10% of the amount found after coculture of effector cells with wt APCs (Fig. 3C). γδ T cells produce low levels of IL-17A. Lung cells were isolated from noninfected, or once- or twice-infected (A–D) wt mice or (E) Rorc(γt)-GfpTG mice and cocultured for 36 h (last 8 h with brefeldin A) with (A–E) Shigella sonicate-loaded APCs or (only in D) APCs alone. A, Identification of IL-17A+CD3+CD4−CD8− cells. Initial gate in the FSC/SSC also includes large cells such as granulocytes and macrophages. B, Numbers of IL-17A+ cell subsets per mouse (means ± SEM, n = 9–14 per group). C, Plots are gated on IL-17A+CD3+CD4−CD8− cells. Identification of TCRγδ expression. Means ± SEM of four mice per group. D, Purified CD90+ T cells derived from twice infected mice (6 d p.i.) were cocultured with APCs obtained from naive wt, β2m°, Ab°, or β2m°Ab° mice previously cultured with medium alone or in the presence of Shigella sonicate. Plots are gated on CD3+CD8− cells. Analysis of IL-17A expression in CD4− and CD4+ cells. E, Cells obtained from twice infected Rorc(γt)-GfpTG mice (6 d p.i.). Plots are gated on CD3+CD4− or CD3+CD4+ cells. Analysis of IL-17A and GFP (indicative of RORγt) expression. Means ± SEM of three mice are shown. The transcription factor retionic acid receptor-related orphan receptor γt (RORγt) is required for the generation of Th17 cells and is also expressed in IL-17A+ γδ T cells (27). In line with the recent reports, we found that ∼75% of IL-17A+CD3+CD4+ and IL-17A+CD3+CD4− T cells coexpressed RORγt. 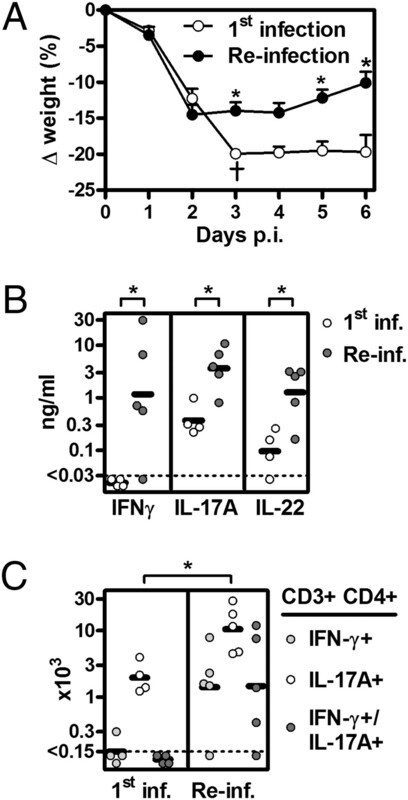 In contrast, RORγt−CD3+CD4+ and RORγt−CD3+CD4− T cells exhibited only a minor population of IL-17Alow–expressing cells (Fig. 4E). To understand why S. flexneri preferentially primes Th17 cells, we analyzed the cytokine profile induced on infection. In rodents, TGF-β in combination with proinflammatory cytokines, most importantly IL-6, has been shown to be essential for the development of Th17 cells. IL-23 was suggested to be a central cytokine for the priming of Th17 cells; however, recent reports indicate that Th17 cells can also develop without IL-23, but is still important for terminal differentiation and long-term survival of Th17 cells (15, 29). Th1 and Th2 instructing cytokines, such as IL-12p70, IL-4, IL-5, and IL-13, were not detected p.i. with S. flexneri (data not shown). We found a strong upregulation of several proinflammatory cytokines and chemokines, including IL-6, IL-1β, TNF, CXCL1 (KC), and CXCL9 (MIG) (Supplemental Figs. 6, 8, and data not shown). The priming of Th17 cells on Shigella infection were dramatically decreased in IL-6° mice. 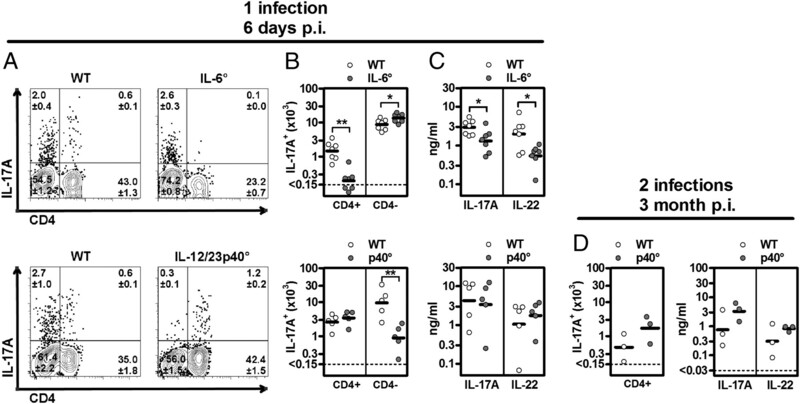 The numbers of IL-17A+CD3+CD4− T cells were significantly slightly increased in IL-6° mice compared with wt mice, which might represent a compensatory mechanism in the absence of sufficient Th17 priming (Fig. 5A–C). Despite this fact, overall IL-17A production by cells derived from IL-6° mice was reduced to 50% compared with wt controls, indicating again that Th17 cells are the main producers of IL-17A in this model. TGF-β and IL-23 were found to be expressed in the lungs of mice. However, the mRNA and protein level remained unchanged on infection with S. flexneri (Supplemental Fig. 5). Surprisingly, IL-12/23p40° mice (deficient for the common subunit p40 of IL-12 and IL-23) were not defective in the priming and maintenance (for up to 3 mo) of Shigella-specific Th17 cells. However, a significant defect in the recruitment of IL-17A+CD3+CD4− T cells on S. flexneri infection was observed in those mice (Fig. 5). These results demonstrate that Shigella-specific Th17 cell priming is dependent on IL-6, but independent of IL-23. In contrast, the induction of IL-17A–producing γδ T cells depends on IL-12/23p40, but not on IL-6. Differential requirement of IL-6 and IL-12/23p40 for the priming of S. flexneri-specific Th17 cells and IL-17A+ γδ T cells. Lung cells of wt, IL-6°, and IL12/23p40° were isolated at indicated time points p.i. and cocultured with APCs loaded with S. flexneri sonicate. A, Expression of IL-17A in CD4+ and CD4− cells isolated 6 d after primary infection. Cells are gated on CD3+ cells. Representative dot plots are shown. Numbers indicate means ± SEM of n = 7 or n = 5 mice, respectively. B, Total numbers of Th17 cells and CD3+CD4−IL-17A+ per lung analyzed by FACS. C, IL-17A and IL-22 were measured in the supernatants after 72 h of coculture. D, Mice were infected twice with S. flexneri and lung cells were isolated 3 mo after the second infection. Total numbers of Th17 cells and levels of IL-17A and IL-22 in culture supernatants were analyzed after 36 or 72 h of coculture with Ag-loaded APCs, respectively. B–D, Each dot represents one mouse. Line represents the geometric of each group. Although Shigella-specific Th17 cells can be found at day 6 after primary infection after ex vivo restimulation, IL-17A levels in lung homogenates increased only very slightly compared with the levels of noninfected mice (Supplemental Fig. 7). This might be explained by the different kinetics of the infection and recruitment of Th17 cells. The pathology in our model peaks at day 3 p.i., whereas Th17 priming is not observed until day 6 when the majority of mice have already cleared the infection (Supplemental Fig. 1). In contrast, a significant production of IL-17A was observed at day 3 after reinfection in wt mice, this production being reduced in CD3° mice (Supplemental Fig. 7). This indicates that in vivo IL-17A also is mainly produced by T cells in Ag-experienced mice. In agreement with the previous finding that IL-17A was only poorly induced during primary infection, we observed that blocking IL-17A activity by treatment with a neutralizing mAb did not have an impact on mortality, CFU counts, and weight loss on primary infection with S. flexneri (Fig. 6A–C). Similar results were obtained in IL-17RA° mice deficient for the main receptor of IL-17A (Fig. 6D–F). In contrast, enhanced weight loss and CFU counts were observed at day 3 p.i. in reinfected mice on anti–IL-17A mAb treatment (Fig. 6G–I). Altogether, these results provide evidence that IL-17A does not play a role in bacterial clearance during primary infection, whereas its production on reinfection significantly restricts bacterial growth. IL-17A improves bacterial clearance on reinfection. A–C, Naive wt mice were infected i.n. with S. flexneri (3 × 107 CFU) and treated with 80 μg anti–IL-17A mAb or control rat IgG i.p. at day 0 and day 2 p.i. A, Mortality, (B) weight loss, and (C) CFU counts at day 3 (n = 9, anti–IL-17A, and n = 22, IgG) and day 5 (n = 22 and 43, respectively). D–F, Naive IL-17RA° and wt mice were infected i.n. with S. flexneri (3 × 107 CFU). D, Mortality, (E) weight loss, and (F) CFU counts at day 3 (n = 11, IL-17RA°, and n = 11, wt) and day 5 (n = 24 and 22, respectively). In two experiments, mice (n = 17, IL-17RA° and wt) were not sacrificed, and mortality and weight were monitored up to day 10 and 7, respectively. G–I, Wt mice were infected i.n. with S. flexneri (3 × 107 CFU) at weeks 0 and 3. At week 11, mice were reinfected with S. flexneri (3 × 107 CFU) and received 80 μg anti–IL-17A mAb or control rat IgG i.p. at day 0 and day 2 p.i. (G) Mortality, (H) weight loss, and (I) CFU counts at day 3 (n = 21, anti–IL-17A, and n = 33, IgG). Weight loss is expressed as mean ± SEM and CFU counts are expressed as geometric means ± SEM. Because we observed higher levels of IL-1β, IL-6, CXCL1, CXCL9, and MPO activity (a marker for polymorphonuclear neutrophil [PMN] recruitment) in reinfected mice compared with primarily infected mice (Supplemental Fig. 8), we tested whether the induction of these mediators relies on the activity of IL-17A. Whether primarily or reinfected mice, no difference in the levels of IL-1β, IL-6, CXCL1, CXCL9, and MPO activity was observed after the blockage of IL-17A activity. In addition, IFN-γ and IL-22 production remained unchanged on treatment with anti–IL-17A Abs (Supplemental Fig. 9). These data indicate that the function of IL-17A in protecting mice from S. flexneri reinfection is independent on the recruitment of PMNs and Th1 cells. Despite the observation of a significant Shigella-specific induction of IL-17A and IL-22 by lung cells 7 mo p.i., FACS analysis did not demonstrate a significant increase of Shigella-induced Th17 cells in the lungs of those mice, possibly because of their low numbers falling below the FACS threshold of detection (Figs. 2B, 3E). Therefore, to directly address the question of whether S. flexneri infection results in the development of long-term Shigella-specific memory Th17 cells, mice were reinfected 12 mo after priming, whereas age-matched naive mice were used as controls. We observed a significantly reduced weight loss in reinfected mice as compared with control mice, indicating a persisting protection 12 mo p.i. (Fig. 7A). 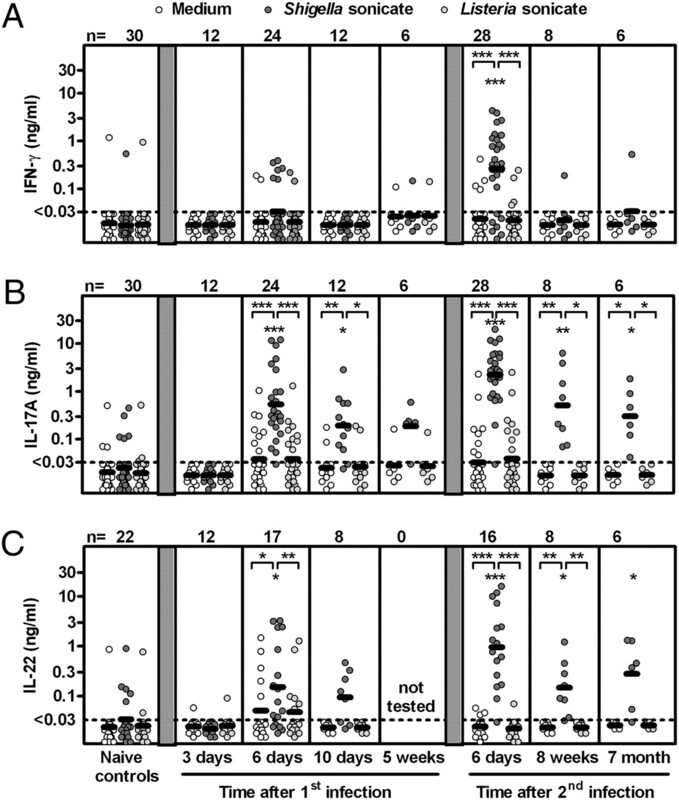 Furthermore, reinfected mice exhibited increased Shigella-induced production of IL-17A, IL-22, and IFN-γ by lung cells (Fig. 7B), along with approximately a 7-fold increase in the number of Th17 cells (Fig. 7C). Taken together, these data strongly suggest that Shigella-specific Th17 cells are maintained in mice up to 12 mo after priming, and give rise to a markedly enhanced recall response after challenge, providing evidence for the existence of a long-term Th17 memory state. S. flexneri induces the development of a long-term Th17 memory state. Wt mice were infected i.n. with S. flexneri (3 × 107 CFU) at week 0 and 3. Control mice received 0.9% NaCl i.n. After 12 mo, control mice and previously infected mice were challenged with S. flexneri (3 × 107 CFU). At day 6 p.i., mice were sacrificed and lung cells were isolated. A, Weight loss is expressed as mean ± SEM of five mice per group. The death of one mouse is shown with a dagger (†). B, Shigella-specific production of IFN-γ, IL-17A, and IL-22 by lung cells after 72 h of coculture with Shigella Ag-loaded APCs. C, Total numbers of CD4+ T cells expressing IFN-γ and IL-17A after 36 h of coculture with Shigella Ag-loaded APCs. B and C, Each dot represents one mouse. Line represents the geometric of each group. In this study, we report that in a murine model of acute bacterial infection with S. flexneri the T cell response is dominated by the induction of long-term memory Shigella-specific Th17 cells that contribute to mediate protective immunity against reinfection. Our findings that T cells mediate protective immunity by acting through B cell-dependent and -independent mechanisms differ from previous results showing a fully protective response in T cell-deficient mice using the same mouse model (11). The observed discrepancies can be explained by the use of an attenuated vaccine strain, in contrast to wt Shigella in our study. But more importantly, mice were challenged 3 wk after immunization, whereas in our study mice were challenged after 8 wk. It is likely that 3 wk p.i., T cell-independent IgM production may be responsible for protection, whereas at later time points T cell-dependent IgG production and memory T cells become significant players. The absence of CD8+ T cell priming reported here is surprising because Shigella is considered an intracellular pathogen with the ability to gain access to the cytosol of epithelial cells and APCs. However, MHC class I Ag presentation to CD8+ T cells might be, in fact, inefficient, because of the capacity of Shigella, after entering the cytosol, to very rapidly induce Caspase-1–dependent cell death in APCs (2, 30, 31). The T cell response induced on S. flexneri infection shows a strong dominance of Th17 over Th1 cell induction, revealing a unique profile of T cell priming. Indeed, the priming of Ag-specific Th17 cells and/or Ag-induced IL-17A production of isolated effector cells has been reported for many pathogens, including intra- and extracellular bacteria, fungi, viruses and parasites, but in most cases the Th17/IL-17A response does not exceed the Th1/IFN-γ response (22–25, 32–34). It has been suggested that intestinal Citrobacter rodentium and pulmonary Bordetella bronchiseptica infections induce a dominant Th17 cell response, but this has been observed after nonspecific restimulation with PMA/ionomycin (35) or the cellular source of IL-17A has not been defined (36). The strong proinflammatory environment and the lack of Th1 and Th2 instructing cytokines observed after S. flexneri infection are consistent with the profile required to prime Th17 cells (15). Effector Th17 cells and the immune suppressive regulatory T cells are linked by their mutual requirement for TGF-β, whose expression remained unchanged on Shigella infection. IL-6, that we found to be strongly induced p.i., has been suggested to function as a cytokine switch that blocks the development and function of regulatory T cells and induces Th17 cells (37). In line with this model, we found that Shigella-specific Th17 cells are almost completely absent in IL-6° mice. Whereas IL-23 has been shown to be important for terminal differentiation of Th17 during autoimmunity (29) and is required for the induction of Th17 cells on Mycobacterium tuberculosis infection (38), we surprisingly found that priming and maintenance (up to 3 mo) of Shigella-specific Th17 cells is unaffected in IL-12/23p40° mice, and therefore independent of IL-23. We may speculate that the highly inflammatory environment in the course of Shigella infection provides other, yet undefined, signals than IL-23 to terminate Th17 development and to induce Th17 memory cells. Apart from CD4+ T cells, it has become evident that also other cells such as γδ T cells, NK cells, and myeloid cells are important producers of IL-17A (19). NKp46+, NK1.1+, and CD11b+ cells were negative for IL-17A expression in our experiments indicating that NK cells, NK1.1+ NKT cells, and CD11b+ macrophages/monocytes and PMNs do not produce IL-17A on Shigella infection. However, we cannot exclude the possibility that the CD3+CD4+IL-17A+ cells, which we identified as Ag- and MHC class II-dependent Th17 cells, contain a minor fraction of CD1d-dependent NK1.1− invariant NKT cells, which have recently been shown to produce IL-17A (39). We found that during S. flexneri infection γδ T cells are another source of IL-17 production. In contrast to several models of bacterial infections for which γδ T cells have been shown to be the main producers of IL-17A (19, 40–44), in our model γδ T cells produced lower levels of IL-17A than Th17 cells, and their number did not increase during reinfection. Confirming recent reports, we showed that the production of IL-17A by γδ T cells was independent on MHC-class II and IL-6, but dependent on IL-12/23p40 (27, 45). We assume that γδ T cells, which very recently have been shown to produce IL-17A in response to TLR2 ligands (45), might contribute to the innate low level IL-17A production observed during primary infection, whereas Shigella-specific Th17 cells are responsible for the strong increase of IL-17A level on reinfection. IL-17A enhances host defenses against certain bacteria and fungi by mediating cytokine/chemokine expression resulting in increased migration of PMNs during the acute phase of infection (14, 46). However, IL-17A can also have detrimental effects in bacterial sepsis, certain models of fungi infection and chronic virus infection, which were associated with uncontrolled inflammation, abscess formation, and/or downregulation of protective Th1 and cytotoxic T cell development (34, 42, 47, 48). A role for IL-17A in vaccine-induced immunity has recently been illustrated in different studies. For instance, CD4+ T cell-derived IL-17A has been shown to protect vaccinated animals from colonization with Streptococcus pneumoniae (49). However, in some reports the distinct roles of IL-17A in nonvaccinated versus vaccinated mice have been poorly defined and it remains obscure to what extent IL-17A was produced by cells of the innate or the adaptive immune system (22, 23, 50). Our results show that IL-17A has no effect on the clearance of S.flexneri on primary infection, consistently with its low production during the innate response. In contrast, on reinfection, IL-17A that is produced by activation of previously primed Shigella-specific Th17 cells, restricts bacterial growth. Surprisingly, in our studies, IL-17A has no effect on the production of IL-17A–inducible cytokines/chemokines, the levels of IFN-γ, and PMN recruitment, suggesting that, in the course of infection with S. flexneri, the function of IL-17A is beyond inflammation or recruitment of Th1 cells. The antimicrobial effect of IL-17A in our model might be mediated through the induction of antimicrobial peptides (18, 51–53) or recruitment of and activation of antimicrobial functions in macrophages (23, 54). Indeed, both macrophages and antimicrobial peptides have been suggested to be critical in the pathogenesis of Shigella infection (30, 31, 55, 56). Regarding antimicrobial peptides, the ablation of Paneth cells, the main producers of α-defensins in the intestine, increases the susceptibility of new-born mice to intestinal infection with S. flexneri (56). In addition, it has been shown that S. flexneri represses, though type III secreted effectors, the production of β-defensin 3 and cathelicidin LL37 produced by intestinal epithelial cells (55). Some other Th17-derived cytokines such as IL-17F or IL-22 have recently been shown to play important roles in host defense against bacterial pathogens (16–18). Interestingly, we found that, like IL-17A, IL-22 was produced by CD4+ T cells after ex vivo Shigella-specific restimulation of isolated effector cells. Both IL-17A– and IL-22–mediated mechanisms of protection on Shigella reinfection deserves further investigation. In conclusion, this study provides a better characterization of the cellular immunity to Shigella infection. However, because of the use of a model of lung and not intestinal infection, studies using samples from Shigella-infected patients will be useful to confirm those findings. It is likely that similar results will be found in the course of the natural infection with a dominating Th17 response, because acute inflammation and a cytokine profile consistent with that required to prime Th17 cells are a hallmark of human shigellosis (57). Furthermore, our study reveals an important role for Th17 cells in secondary immune responses to acute bacterial infections, thus highlighting the contribution of those cells to long-term memory. Targeting such a response might be a promising strategy for future vaccine design. However, given the link of certain enteric infections, including shigellosis, to reactive arthritis, it has to be defined whether pathogen- and/or vaccine-induced Th17 responses influence the immune balance to self-Ags and the intestinal flora. We thank Myriam Tanguy for technical assistance, Allison Marty for critical reading of this manuscript, Anne Thiebaut and Claire Bernède-Baudin for help in the statistical analysis, Matthias Lochner for genotyping of Rorc(γt)-GfpTG mice and helpful discussion, and Mathew Alberts and Helene Saklani for providing IL-12/23p40° mice. The work was supported by a grant of the German Research Foundation (SE1122/1-1), a Marie Curie Intra-European Fellowships grant (no. 011192), a Bourse Roux from the Institute Pasteur, and an Institut Pasteur grant (PTR 154).
. 2007. Clinical trials of Shigella vaccines: two steps forward and one step back on a long, hard road. Nat. Rev. Microbiol. 5: 540–553.
. 2007. Shigella’s ways of manipulating the host intestinal innate and adaptive immune system: a tool box for survival? Immunol. Cell Biol. 85: 119–129.
. 2000. Production of IFN-gamma and IL-10 to Shigella invasins by mononuclear cells from volunteers orally inoculated with a Shiga toxin-deleted Shigella dysenteriae type 1 strain. J. Immunol. 164: 2221–2232.
. 1996. Changes in the peripheral blood T-Cell receptor V beta repertoire in vivo and in vitro during shigellosis. Infect. Immun. 64: 1391–1399.
. 1995. Shigella infection induces cellular activation of T and B cells and distinct species-related changes in peripheral blood lymphocyte subsets during the course of the disease. Infect. Immun. 63: 2941–2949.
. 2006. High vaccine efficacy against shigellosis of recombinant noninvasive Shigella mutant that expresses Yersinia invasin. J. Immunol. 177: 4709–4717.
. 2002. Secretory component: a new role in secretory IgA-mediated immune exclusion in vivo. Immunity 17: 107–115.
. 2005. Roles for T and NK cells in the innate immune response to Shigella flexneri. J. Immunol. 175: 1735–1740.
. 2000. Caspase-1 activation of IL-1beta and IL-18 are essential for Shigella flexneri-induced inflammation. Immunity 12: 581–590.
. 1995. Monoclonal immunoglobulin A antibody directed against serotype-specific epitope of Shigella flexneri lipopolysaccharide protects against murine experimental shigellosis. J. Exp. Med. 182: 769–778.
. 1999. Thymic independence of adaptive immunity to the intracellular pathogen Shigella flexneri serotype 2a. Infect. Immun. 67: 3970–3979.
. 2008. Immunological commonalities and distinctions between airway and digestive immunity. Trends Immunol. 29: 505–513.
. 2008. Regulation of immunological homeostasis in the respiratory tract. Nat. Rev. Immunol. 8: 142–152.
. 2009. Interleukin-17 in host defence against bacterial, mycobacterial and fungal pathogens. Immunology 126: 177–185. 2008. TH17 cells in development: an updated view of their molecular identity and genetic programming. Nat. Rev. Immunol. 8: 337–348.
. 2008. IL-22 mediates mucosal host defense against Gram-negative bacterial pneumonia. Nat. Med. 14: 275–281.
. 2008. Interleukin-22 mediates early host defense against attaching and effacing bacterial pathogens. Nat. Med. 14: 282–289.
. 2009. Differential roles of interleukin-17A and -17F in host defense against mucoepithelial bacterial infection and allergic responses. Immunity 30: 108–119.
. 2008. gammadelta T cells: an important source of IL-17. Curr. Opin. Immunol. 20: 353–357.
. 2003. Cutting edge: roles of Toll-like receptor 4 and IL-23 in IL-17 expression in response to Klebsiella pneumoniae infection. J. Immunol. 170: 4432–4436.
. 2008. Microbial flora drives interleukin 22 production in intestinal NKp46+ cells that provide innate mucosal immune defense. Immunity 29: 958–970.
. 2007. IL-23 and IL-17 in the establishment of protective pulmonary CD4+ T cell responses after vaccination and during Mycobacterium tuberculosis challenge. Nat. Immunol. 8: 369–377.
. 2006. TLR4 mediates vaccine-induced protective cellular immunity to Bordetella pertussis: role of IL-17-producing T cells. J. Immunol. 177: 7980–7989.
. 2008. Respiratory Francisella tularensis live vaccine strain infection induces Th17 cells and prostaglandin E2, which inhibits generation of gamma interferon-positive T cells. Infect. Immun. 76: 2651–2659.
. 2008. 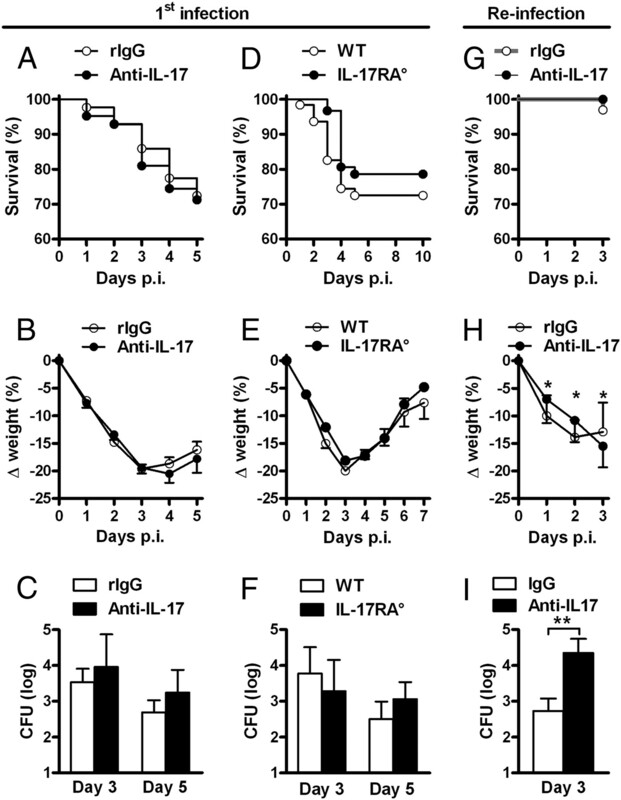 IL-17A is produced by Th17, gammadelta T cells and other CD4- lymphocytes during infection with Salmonella enterica serovar Enteritidis and has a mild effect in bacterial clearance. Int. Immunol. 20: 1129–1138.
. 1996. Induction of adherence and degranulation of polymorphonuclear leukocytes: a new expression of the invasive phenotype of Shigella flexneri. Infect. Immun. 64: 719–723.
. 2008. In vivo equilibrium of proinflammatory IL-17+ and regulatory IL-10+ Foxp3+ RORgamma t+ T cells. J. Exp. Med. 205: 1381–1393.
. 2006. Characterization of functional oligosaccharide mimics of the Shigella flexneri serotype 2a O-antigen: implications for the development of a chemically defined glycoconjugate vaccine. J. Immunol. 176: 1686–1694.
. 2009. The interleukin 23 receptor is essential for the terminal differentiation of interleukin 17-producing effector T helper cells in vivo. Nat. Immunol. 10: 314–324.
. 2007. Differential regulation of caspase-1 activation, pyroptosis, and autophagy via Ipaf and ASC in Shigella-infected macrophages. PLoS Pathog. 3: e111.
. 1992. Shigella flexneri induces apoptosis in infected macrophages. Nature 358: 167–169.
. 2009. IL-10 deficiency unleashes an influenza-specific Th17 response and enhances survival against high-dose challenge. J. Immunol. 182: 7353–7363.
. 2007. IL-23 and the Th17 pathway promote inflammation and impair antifungal immune resistance. Eur. J. Immunol. 37: 2695–2706.
. 2006. Bordetella bronchiseptica modulates macrophage phenotype leading to the inhibition of CD4+ T cell proliferation and the initiation of a Th17 immune response. J. Immunol. 177: 7131–7138.
. 2005. IL-23 compensates for the absence of IL-12p70 and is essential for the IL-17 response during tuberculosis but is dispensable for protection and antigen-specific IFN-gamma responses if IL-12p70 is available. J. Immunol. 175: 788–795.
. 2007. Identification of an IL-17-producing NK1.1(neg) iNKT cell population involved in airway neutrophilia. J. Exp. Med. 204: 995–1001.
. 2006. IL-17 production is dominated by gammadelta T cells rather than CD4 T cells during Mycobacterium tuberculosis infection. J. Immunol. 177: 4662–4669.
. 2007. IL-17-mediated regulation of innate and acquired immune response against pulmonary Mycobacterium bovis bacille Calmette-Guerin infection. J. Immunol. 178: 3786–3796.
. 2008. Adverse functions of IL-17A in experimental sepsis. FASEB J. 22: 2198–2205.
. 2007. Resident Vdelta1+ gammadelta T cells control early infiltration of neutrophils after Escherichia coli infection via IL-17 production. J. Immunol. 178: 4466–4472.
. 2009. Interleukin-17-producing gammadelta T cells selectively expand in response to pathogen products and environmental signals. Immunity 31: 321–330.
. 2005. Divergent roles of IL-23 and IL-12 in host defense against Klebsiella pneumoniae. J. Exp. Med. 202: 761–769.
. 2009. Th17 cells enhance viral persistence and inhibit T cell cytotoxicity in a model of chronic virus infection. J. Exp. Med. 206: 313–328.
. 2003. CD4+ T cells mediate abscess formation in intra-abdominal sepsis by an IL-17-dependent mechanism. J. Immunol. 170: 1958–1963.
. 2008. Interleukin-17A mediates acquired immunity to pneumococcal colonization. PLoS Pathog. 4: e1000159.
. 2006. Antibody-independent, interleukin-17A-mediated, cross-serotype immunity to pneumococci in mice immunized intranasally with the cell wall polysaccharide. Infect. Immun. 74: 2187–2195.
. 2006. Interleukin (IL)-22 and IL-17 are coexpressed by Th17 cells and cooperatively enhance expression of antimicrobial peptides. J. Exp. Med. 203: 2271–2279.
. 2008. Cytokine-mediated regulation of antimicrobial proteins. Nat. Rev. Immunol. 8: 829–835.
. 2004. IL-17 markedly up-regulates beta-defensin-2 expression in human airway epithelium via JAK and NF-kappaB signaling pathways. J. Immunol. 173: 3482–3491.
. 2009. Cellular effectors mediating Th17-dependent clearance of pneumococcal colonization in mice. J. Clin. Invest. 119: 1899–1909.
. 2008. Virulent Shigella flexneri subverts the host innate immune response through manipulation of antimicrobial peptide gene expression. J. Exp. Med. 205: 1121–1132.
. 2008. Maturation of paneth cells induces the refractory state of newborn mice to Shigella infection. J. Immunol. 180: 4924–4930.
. 1995. Persistence of local cytokine production in shigellosis in acute and convalescent stages. Infect. Immun. 63: 289–296.